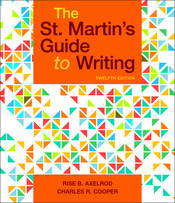 I’m honored to have an op-ed piece I wrote for Inside Higher Education reproduced in The St. Martin’s Guide to Writing, 12th edition by Rise B. Axelrod and Charles R. Cooper. My piece appears starting on page 257 in Chapter 7, Proposing a Solution. Here is the original op-ed in Inside Higher Education from January 2017.